I have been enjoying Chris' continuing review of Douglas Campbell's huge tome The Deliverance of God. Those people interested in the topics covered there will likely enjoy my new book which has just been published. Chris has invited me to fill you in on it here. My book deals with many of the same issues, but is a much easier read (I imagine I'm not the only one who's struggled to reach the end of Campbell's monstrous work). * You like the New Perspective on Paul. * You are interested in understanding how the Gospels depict Jesus. * You would like to understand Paul's theology, and how it can be reconciled with the rest of the New Testament. * You would like to know more about different ideas of atonement. * You are interested in learning how the concept of salvation has changed throughout church history. * You are interested in reading a systematic presentation and defense of the moral influence view of atonement. * You are looking for a believable alternative to Penal Substitution. * You love Douglas Campbell's ‘PPME’ model and want to read about one. This book provides a brief critique of the Reformation paradigm of salvation by faith alone, which centers on Penal Substitution. In contrast to that theory, it presents a complete alternate system of salvation, and systematically argues that this alternate system is really what the first Christians believed and taught. This alternate system is not one of our own creation, but rather (as our historical analysis demonstrates) has been extremely popular throughout Christian history – particularly during the first few centuries. We begin by looking at the question: "If early Christians didn't think Jesus' purpose was to die as a penal substitute for the sins of humanity, then what understanding of his life and death did the Gospel writers actually have?" To answer this question, we briefly survey the gospels in the light of socio-historical research to see how Jesus' contemporaries would have understood his words and actions as presented in the Gospels. For those familiar with socio-historical studies, there is little new in this section of the book. However, for those accustomed to thinking that the sole purpose of Jesus' life is found in his death on the cross to atone for the sins of humanity, this analysis of the Gospel accounts may be eye-opening. The second section of the book works through a number of important New Testament theological concepts: Grace, Faith, Final Judgment, Forgiveness, Righteousness, Works of Law etc. Based on the findings of recent scholarship, we provide dramatic reinterpretations for each of these concepts, which challenge the standard Reformation views. For example, we review the conclusions of many recent scholars (Douglas Campbell among them) who have pointed out that ‘faithfulness’, rather than ‘faith’, represents a more appropriate translation of pistis. We also argue this point extensively using additional evidence from the New Testament and other ancient Greek writings. This understanding leads us to interpret Paul’s statements of 'salvation by faith' very differently - that salvation comes through faithfulness to Christ (obedience to Christ's teachings). We show that salvation is primarily about positive moral change. This moral change leads to an assurance of positive final judgment, as God's judgment is based on the moral character of the individual. Throughout our reinterpretation of these concepts, we draw from extensive biblical support and cite many scholars who agree with these alternative readings, and so in one sense we propose nothing new. The significance of this book is that it ties all of these reinterpretations together into a systematic paradigm of salvation ("Moral Transformation") and extensively demonstrates at each point that this view was what the biblical writers really taught. The third section of the book looks at what the early Christians considered significant about Jesus and his activity. Here we begin by drawing together verses regarding salvation to illustrate that they believed Jesus had saved them through a process of moral transformation. The chapters analyzing the early Christian concept of Jesus as a martyr and their use of sacrificial language in reference to Jesus should be of particular interest. The concept of Jesus as a martyr has only recently begun to receive considerable attention in scholarship on early Christianity, so this section may well interest many readers. We argue that Paul understood Jesus' death primarily as a martyrdom, and numerous statements throughout his letters attest to this, especially ones in Romans. The understanding of sacrificial systems within scholarship advanced a great deal in the 20th century with numerous anthropological studies of sacrifice being conducted. The conclusions of such studies have important consequences for understanding what the New Testament writers meant when they used sacrificial language about Jesus. Penal substitution advocates have traditionally seen sacrificial language as decisive proof of their view. However, we use this improved understanding to argue that the sacrificial language in the New Testament is incompatible with penal substitution. 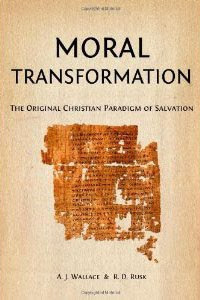 The fourth section of the book presents an extensive historical case that the moral transformation paradigm of salvation finds universal attestation in the writings of the ante-Nicene Church Fathers, and is strongly attested throughout much of the rest of Christian history. We also outline the key doctrinal changes over the centuries, which culminated in the Reformation doctrines of salvation by faith and penal substitution. Finally, we offer a brief critique of these Reformation doctrines. Each individual point in this book has been argued for by scholars, but this book ties all these together in a way that, to my knowledge, is very unique. I know of no other book that ties all this scholarship together into a complete picture and shows how strongly it challenges us to re-understand the early Christian paradigm of salvation. At the risk of being impertinent: I don't know the publisher, nor the authors. Could you say something about their social location and their credentials? I have encountered Andrew Wallace’s views before, both on his blog and on a forum called Theologyweb (where he used to comment under the name of ‘Tercel’). I have been intrigued, curious and frustrated about some of the stuff he says. I have also found similar views advanced elsewhere (most notably http://www.whoreallygoestohell.com/ and www.oldoldstory.org) though Andrew's seem to be the most informed and scholarly so far. This approach is fascinating, and I think it’s good and important that Andrew and others raise serious points, and get us thinking about some key questions that have been neglected. I also have several concerns with his type of proposals which I will outline bellow. But first, a disclaimer - As I’m only going on the bits and pieces I’ve read online I realise I probably haven’t understood Andrew’s thesis fully. Also, I am nowhere near as knowledgeable or clever as he is (my relevant formal qualifications go no further than a meagre CertHE in theology) so my comments may well sound rather dumb. 1. Over Polemical – In a fashion that’s similar to the way the ‘new atheists’ present an extreme or caricatured version of Christianity to knock down, could it be that Andrew does this with evangelical Christianity? So may writers do this including the ones I linked above, those of the emergent movement (Brian McLaren, Rob Bell etc.) and I reckon even Doug Campbell in his (massive) deliverance book. That is, to set up a ‘mainstream evangelical’ view in which the gospel is not much more than a crude form of penal substitution and then to knock it down, showing how wrong it is biblically and practically. Such a framing of the debate is rather unhelpful and can present a false dichotomy. While it’s true that some (perhaps many) evangelicals have that kind of crude view of the gospel, many others (including big brains such N.T. Wright, Ben Witherington & Scott McKnight etc.) do not and have far more deep, sophisticated and biblically rooted views of the gospel. 2. An over enthusiastic approach to the church fathers - The church fathers certainly need to be read and learned from. However, I am cautious about a ‘the church fathers were nearer to the time of the apostles so are therefore the key to understanding the new testament’ type of notion. The gnostic writers were also nearer to the time of the apostles but I don’t hear people suggesting that they are key to understanding the NT (apart from Dan Brown of course). If false teaching was emerging in the church during the time Paul wrote the Corinthian correspondence, then it doesn’t take a stretch of the imagination to believe that the apostolic fathers also got some things wrong. Also, the fathers had a background of Greek or pagan culture (rather than Jewish) which would have affected their understanding significantly . I reckon this can be seen in (what seems to me) their very legalistic understanding of holiness & righteousness. I'm therefore wary of folks taking the father’s quotes about salvation to accurately represent the view of the NT just as I would be about taking their balmy quotes on other matters (such as aestheticism ) to be indicative of the truth. 4. The Cross - I’m not totally clear on what Andrew’s views on the atonement are. In some stuff he wrote a while ago, he seems to agree with some sort of Christus Victor model, though the above summary indicates a solely Christ Exemplar view. If the latter is the only purpose for the cross, then why do the gospels make an absolutely HUGE thing out of Jesus’ death and not as much out of his moral teaching? If Andrews view is correct then surely there would be more stress on the latter. John (for example) hardly even talks about moral commands (apart from general exhortations to love each other). In Matthew 26:28 Jesus talks about his blood being shed for the forgiveness of sins. How that fits into a martyrological account I cannot comprehend, as well as many other scriptures that appear to speak of Christ's death being directly efficacious in salvation. 5. Salvation by works - Here I more or less echo the sentiments of Mark Regier in his guest review. I fail to see how this gospel is good news. On the blog linked under my name I have reflected on some acute struggles relating to assurance and wrestling with faith/works . Now, I once posted about these struggles on Tweb and I seem to remember Andrew did lovingly reply with some sympathetic and gracious thoughts. However, I couldn’t help thinking that his pastoral assurances weren’t quite in line with his expressed views. At the end of the day, if we are saved by our works then there is a line we must pass in order to be ultimately saved. The question is, where is that line? Andrew seems to think (in his more personal rather than scholarly reflections) it’s not actually that high, and God is most bothered about the general inclinations of heart. However, some of the Father’s put the line very, very high (just read the Shepherd of Hermas or the Didache), sometimes even denying the possibility of forgiveness for post baptismal sin. Other exponents of this kind of view (such as those I linked in my first post above) put the line somewhere in between. The New Testament though, doesn’t seem to tell us where the line is. Maybe it’s because there isn’t one. Throughout the epistles Jesus is emphasised as Lord and Saviour but not Teacher and I can’t see how teaching us to be good is paramount to saving us. I play the piano and occasionally earn a bit of extra cash playing jazz here and there. Over the years there have been piano teachers (and great players I admire) who have inspired and helped my progress, but ultimately I can play because I put the hard hours of practice in myself. It would be nonsense for me to say my ability was a gracious gift of my past teachers or jazz piano idols, and I certainly wouldn’t pass my earnings on to them! I'm flattered that you've clearly paid enough attention to things I've said over many years to make such careful observations. I warn you that my views on many matters have matured over the course of my studies. Posts I wrote years ago on internet forums are not necessarily representative of my current views. 1. The polemic levels in my book are carefully measured. We spend most of our time making our own case, but sometimes we do have to engage viewpoints with which we disagree. In my internet posts I do let my enthusiasm run a bit wilder and freer and am doubtless quite polemical at times, and I love a good argument. 2. I feel there is much to be gained from the writings of the Church Fathers. There is also much I strongly object to in their writings. I don't at all see the Church Fathers as "the key" to understanding the New Testament! They're helpful in providing a demonstration that my interpretations of New Testament writings were widely held within Christianity very soon after the New Testament was written. 3. 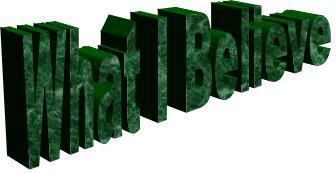 I interpret many words and passages in the New Testament untraditionally. That's basically what my book is about. I argue that many key terms have been mistranslated or misunderstood (eg 'faith', 'grace', 'justification'), and I can cite plenty of scholars supporting my reinterpretations of these terms. Mostly as a result of this, I reinterpret many passages containing these words. Of course, I have awesome interpretations of lots of other passages too! But I'm afraid I'm hardly alone in this, as there are a lot of social-historical context scholars doing a lot of reinterpretations of the gospels and a lot of New Perspective scholars reinterpreting Paul. 4. My book covers the atonement far more comprehensively than anything I have ever written on the internet. I have explored a variety of atonement views in various internet posts over the years as I investigated them. I find the claim that the gospels emphasize Jesus' death to the exclusion of his teaching rather shocking claim and it strikes me as just plain wrong. 5. How high is 'the bar' of salvation? Early Christianity contained a diverse range of answers to that question. It is the view of myself and the co-author of my book that the logical implication of the New Testament doctrines of repentance and forgiveness and judgment is that God is concerned about the general inclinations of the heart. If a person cares enough about what God wants to worry that they might not be doing well enough, then it is precisely that concern about what God wants that demonstrates their heart is right with God. The wicked are not concerned by their wickedness, but those whose hearts are set on God and want to do his will find their misdeeds concerning. Thus it is not a matter of saying "a person who does more righteous than wicked deeds is right with God" but rather that a person who wishes to do more of what is right than they currently do who is right with God. Thanks for your responses. There’s not much more I can adequately comment on without reading the book, and surveying your comprehensive arguments. I’d like to come back on a couple of things though. My point about the gospel’s emphasis on Jesus death was less about theological statements on the atonement and more about the way they frame the passion narratives in terms of climax. It has been commented, for example, that Mark structures his gospel as one long passion narrative (one steady journey to Jerusalem, in contrast to the many visits in John). Even before he arrives there are a series of statements where Jesus talks about the necessity of his coming death. (see Mark 8:31, Mark 9:31, Mark 10:33-34). I have difficulty seeing such statements in purely martyrological terms. I expect you explain fully your reasons in your book though. Also, if Jesus’ teachings were the crux of the matter then why is there a gaping lack of the Jesus tradition in Paul? Apart from Acts 20:35 he is never quoted which seems to be quite a glaring omission if Jesus’ commands were at the heart of the gospel message. I liked what you said in your last paragraph (your counsel even sounded at times similar to something you’d expect a reformed conservative evangelical to say!). However, I can’t help feeling that it sounds a bit like positive spin. I find that when reading the NT through the lens of your suggested paradigm the actual stakes seem very harsh & high. Anyway, I look forward to seeing what the reactions to this book are, and reading some reviews from folks who (unlike myself) know what they are talking about. I remembered all the stuff you wrote because I’m always interested in those who are trying to cut unnecessary baggage from Christianity (theological or otherwise) and live the faith more authentically. After several years of study of the history of doctrine I came to similar conclusions to the authors' (though without the ability to clearly articulate them as they have). This book is simply the benchmark for a new reformation in soteriology. The only significant weakness I found was it's lack of engagement of eschatology. I suggest that the authors merge their thoughts into an eschatology such as Andrew Perriman's partial preterism. The combination of the covenantal transformation message and the moral transformation message would be unassailable in my opinion. wouter, the book is self-published and the authors have no formal theological education.